Navigate to “System → Cache Management” and disable/clean all Magento caches and disable the Magento compiler (if enabled). Upload the directories “app” (within the folder src in your download package) to your Magento root directory (“app”⇒“app”). If you are currently logged in Magento Admin, please log out and log in again to allow your admin account to receive the required permissions to edit the extensions configuration. Recompile and turn on the compiler again if it was enabled before the installation. Navigate to “System → Cache Management” and refresh/reactivate all caches. The installation procedure is now completed. The next step is to configure the extension. Navigate to “System → Configuration → Sales Emails”. There should be a new section called ”Auto send invoice for payment methods”. 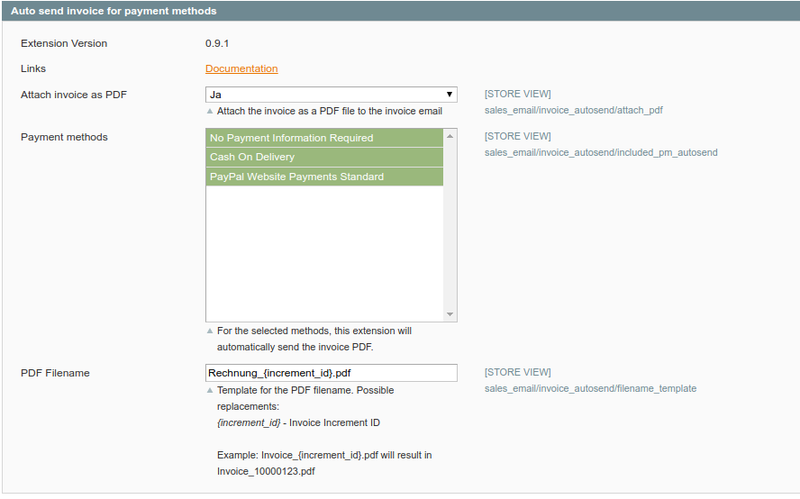 After you have applied your settings, upon invoice creation, the invoice transactional email will be sent and the invoice PDF will be attached.